Warning: Do not attempt to rotate arm or force abduction of fracture or dislocation is suspected. 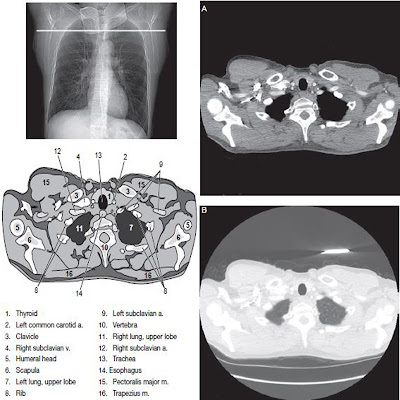 Osteoporosis, osteoarthritis, and the Hill-Sachs defect with exaggerated rotation may be demonstrated. 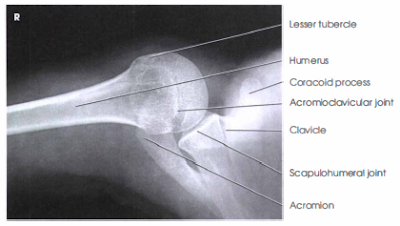 Inferosuperior axial shoulder joint: Lawrence method. Place lead shield over pelvis and radiosensitivity regions. Position patient supine with shoulder raised about 2 inches (5 cm) from table top by placing support under arm and shoulder to place body part near center of IR. Move patient toward the front edge of tabletop and place a cart or other arm support against front edge of table to support abducted arm. Rotate head towards opposite side, place vertical cassette on table as close to neck as possible, and support with sandbags. Abduct arm 90 degree from body if possible; Keep in external rotation, palm up, with support under arm and hand. Direct CR medially 25 to 30 degree, centered horizontally to axilla and humeral head. 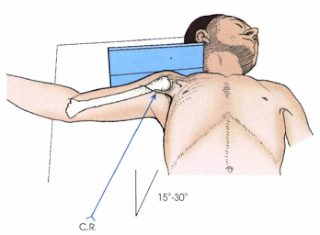 If abduction of arm is less than 90degrees, the CR medial angle also should be decreased to 15 to 20 degree if possible. An alternative position is exaggerated external rotation*. An anterior dislocation of the humeral head may result in a compression fracture of the articular surface of the humeral head, called the Hills-Sachs defect. This is best demonstrated by exaggerated external rotation, where in the thumb is pointed down and posteriorly about 45 degrees. Lateral view of proximal humerus in relationship to the scapulohumerus cavity is shown. Carotid process of scapula and lesser tubercle of humerus will be seen in profile. The spine of the scapula will be seen on edge below the scapulohumeral joint. Arm is seen to be abducted about 90degree from the body. The superior and inferior borders of the glenoid cavity should be directly superimposed, indicating correct CR angle. CR and center of collimation field should be at the axilla and the humeral head. 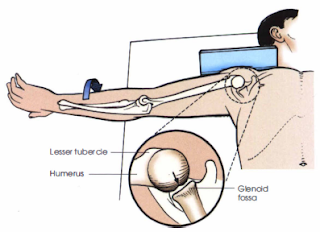 The bony margins of the acromion and distal clavicle will be visible thought the humeral head.